The Chico Horticultural Society, Inc was organized May 1921, by Mr. W.F. Wight, founding President. The non-profit organization is a charter member of California Garden Clubs, Inc., October 1931. "Come grow with us!" That's Chico Horticulture Society's standing invitation to anyone who likes or wants to get their hands dirty and grow things. "Our primary interest is to assist and educate the public and our members on all topics of flora and horticulture including flower design and growing," said Susi Gillum, president. 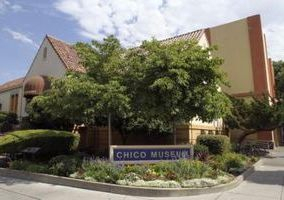 Founded in 1921, "Chico Hort," as its members call it, is one of the oldest horticulture societies in the state. It is also a charter member of California Garden Clubs Inc., a statewide horticulture society chartered in 1931. "The society has a long, long history and is very respected throughout the state. I go to horticulture events and when I tell people where I'm from, they say 'oh, I've heard about you guys.' I'm very, very proud to be a member of such a highly respected society," said Gillum. Membership in the society stands at 57 and includes farmers, accredited horticulture judges, professional landscapers and gardeners, floral businesses, design shops, farmers and beginners. "I knew about roses and iris but not much about any other kind of flower — what they do, where they grow, or how to take care of them," said member Dorothy Showmaker. "It's a learning process when you first start but at Chico Hort there are master gardeners, people who are knowledgeable who will help you." The membership ranges in age from 50 to 90 with the majority falling between 60 and 80, said Showmaker.For some people, membership in Chico Hort is a "family thing." Several current members, including Gillum and her husband Mike, are second and third generation Chico Hort members.The Chico Hort lineage in the Gillum family goes back three generations to Mike's grandmother, Zoe Gillum, who represented Chico Horticulture Society and Butte County at the 1933 World's Fair on Treasure Island. His aunts and mother were also members. Mike became a member in 1951 and Susi joined in 1989. They are continuing the family tradition with their grandchildren. "Mike and I are avid gardeners. Both our families lived in rural areas and did for themselves. If you love to garden there's nothing better than passing that passion on to your children and grandchildren," said Gillum. In addition to sharing knowledge with one another, guest speakers and special program topics are included in the monthly meetings. "We have such great programs. We've had them on drought, composting, worm farming and good and bad bugs and how to get rid of them safely. Of course, it's easier to get the bugs than get rid of them. But we learned about stuff that can be used around pets, like oatmeal. If you spread it around the snails will eat it and it expands killing them. If the dog eats some too, it won't hurt him," said Showmaker. In addition to their own learning, Chico Hort also educates and gives back to the community through community gardens and school programs.Club members have planted and maintained the gardens at the Chico library, the veteran's garden in the City Plaza, the garden surrounding the Chico Museum. "I volunteer in the museum garden. I enjoy it. People come up and ask about the plants. One man, the owner of Madison Bear Garden, came up and told us what a wonderful thing we were doing by beautifying the veteran's garden. He was just tickled pink," said Showmaker. While the community garden projects are near and dear to members, the School Gardening Program is "our most important" project, said Gillum.Among the schools that have received grants are Hamilton High School, Chico Country Day School, Blue Oak Charter School, Nord School and Loma Vista School. Each of these schools has used their grants to create gardens as well a variety of other horticulture-related projects. Loma Vista, for example, did a project on recycling food waste, creating a compost and building a worm bin. "Nord Country Day has an outstanding project. They have received grants from us for many years. They are teaching the children how to grow their own and they have put in an orchard. The children reap what they sow and they learn how to cook the fresh food. They are also growing flowers which the children may pick and take home to their moms or their dads. It's very cool," said Gillum. Chico Horticultural raises money for the School Gardening Program through its annual plant and flower sale held every April at the Home and Garden Show(used to be held In October) and also The Greens Workshop held in December. These money raising efforts typically garner about $1,500 for the school grants. Gillum's goal is to increase the fundraisers to increase the grant funds. "This program is really, really important one to me. My goal is to try to increase the amount of grant money we can to the schools. I don't think there's anything better that to have a child learn to garden Something about putting seeds in ground and seeing them fruit. Children learn how to do something good. They also learn math, responsibility, taking care another living thing. It's incredible what this program does for these kids," said Gillum. Meetings: 12:30 p.m. third Monday of the month, September-June, at Chico Public Library. "Object shall be to promote activities pertaining to Horticulture, to educate it's members in home gardeing and the art of flower arranging, to sponsor and participate in flower shows, conservation and civic beautification projects." CHICO >> The Chinese symbol of balance and harmony is the first thing one sees when entering the Humboldt Community Garden. 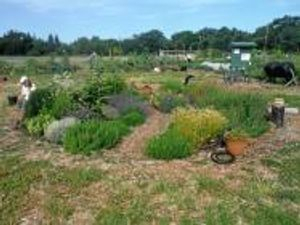 Planted in a traditional Yin Yang design is the Chico Horticulture Society's herb garden, with a mix of 26 medicinal and culinary herbs "free for the pickin'," by anyone who has a plot within the garden's gates. The year-round Yin Yang garden is maintained by nine horticulture society members who rotate once a week. It measures approximately 25-by-60 feet, and boasts perennials like oregano, yarrow, echinacea, sweet bay laurel, thymes and valerian to name a few. This year they added a few annuals like basil and seeded cilantro. This is the herb garden's third summer season. Butte Environmental Council President Mark Stemen emphasized the Yin Yang garden reinforces the community garden concept. "Our vision is to show people how to garden. The herb garden is perfect because everyone doesn't need to grow their own. "In fact," added Stemen "the more we use, the better it gets. So we're encouraged to trim and take herbs." 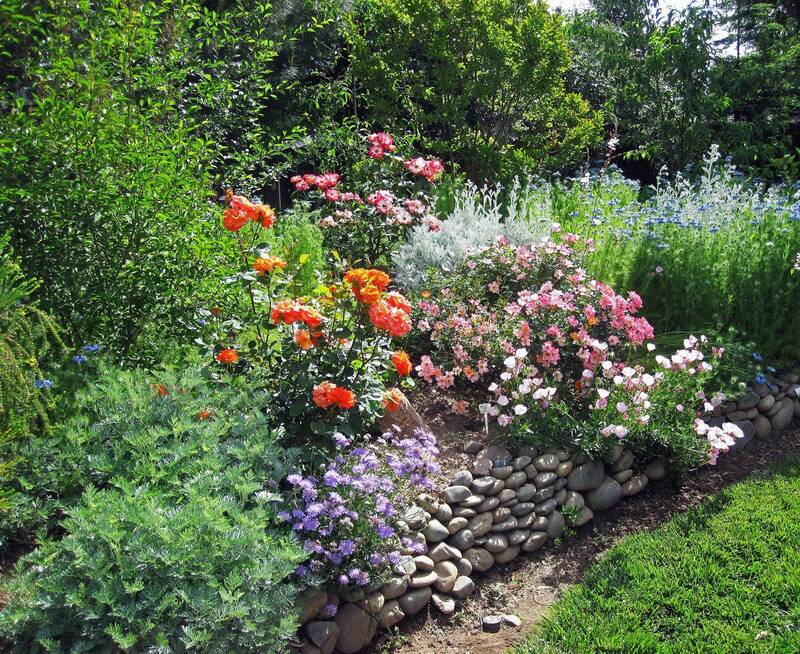 Chico Horticulture's involvement began two years ago when member Tina Lando approached then-President Jennifer Jewell about an idea for a plot within the newly created garden. At the time, Lando was taking a Chico State University sustainability class from Stemen, a professor of environment studies. The class had researched, planned, and designed Chico's first community garden on Humboldt Road. "I loved the idea, and was willing to help in any way," said Jewell. After club approval, Lando, Stemen and Jewell worked together to get the soil ready, move compost and hack down weeds. Jewell's expertise guided the project. "She knows the plants, she decided what to plant, ordered them and I dug the holes," said Lando. "Originally Tina and Jennifer wanted to give us a rose garden," remembered Stemen. "But there is a rule that plots have to be edible." So they went back to the drawing board and came up with a mix of herbs placed in a Yin Yang design, with a path down the middle. "We wanted plants that would survive here – sort of Mediterranean adapted," said Jewell. "We didn't want anything that was so aggressive or gets too big." The Society likes feedback on which herbs are being picked and how they are being used, and occasionally experiment with herbs from other gardeners. "Most people are excited about the herbs they don't know about, like chocolate flower," said Jewell. This spring, with help from fellow gardener Steve Handy, Lando put in a timed drip irrigation system. Jewell acknowledged that the Yin Yang garden is a departure from the club's other two public gardens, at the Veterans Memorial in City Plaza and at the Chico Museum. "It is a little more fundamental and more sustainable, and a lot of people in the club like that." "One of the things we wanted to move away from," added Jewell, "was maintenance. Our focus was perennial, sustainability and climate-adapted plants." Jewell stressed the garden club's mission is to educate. She thinks that the Yin Yang project represents a younger demographic and a new generation which many longtime members appreciate. Stemen called the herb garden "one of the best donations" to the community garden. "It was their gift to the community garden, and it is there for everyone to use." The Humboldt Community Garden has 55 plots for lease. Growers include individual gardeners and other nonprofits like ARC and the Veterans Administration. This school year Stemen's Chico State sustainability class designed and built Oak Way, Chico's second community garden. Oak Way is designed to serve individuals with mobility challenges. Its wider walkways and meandering paths provide greater accessibility for wheelchairs and the elderly. Stemen is excited to have Northern California Independent Living Services put in a plot this summer. At both community gardens, Stemen stresses how accessibility and cultural diversity build community, and add flavor to everyone's gardening experience. He believes the Yin Yang herb garden is a metaphor for community, "The more you trim, the fuller it gets, and the more we use community, the better it gets." Tina Lando working in the Humboldt Community Garden June 2014 at Chico, California. Photo courtesy of Chico Enterprise Record newspaper.